Living a Fit and Full Life: Cut Out Cross Contamination with CleanCutting Sheets! Cut Out Cross Contamination with CleanCutting Sheets! CleanCutting Sheets. A disposable bamboo sheet that inspires cleaner kitchens and safer meals. Natural bamboo cutting sheets with optional low-tack grip to adhere sheet to surface while cutting. Comes in a reusable sleeve for storage. Cut out cross contamination with CleanCutting Sheets! If you cook with a lot of raw meat then CleanCutting Sheets are definitely for you. I love chicken and cook with it at least 3 to 4 times a week and always worry about cross contamination. With CleanCutting Sheets you can adhere the sheet to the surface so there's no slipping while you're cutting. I can't even tell you how many times I've had my cutting board slip and almost cut myself. Then, when you're done you can simply toss them in the trash. They're extremely thin and flexible so you can also fold the CleanCutting Sheets and simply dump the ingredients into a pot directly from your CleanCutting Sheets. CleanCutting Sheets truly are a revolutionary product for stomping out cross contamination. No longer do you have to worry about what's lingering on your cutting board. No longer do you have to worry about disinfecting your cutting board after using raw meat. 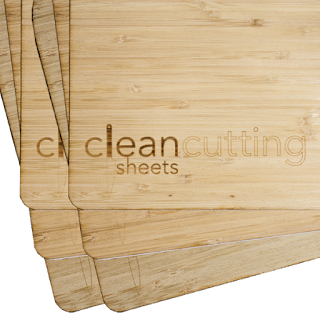 With CleanCutting Sheets you can eliminate any worry of cross contamination from your cutting board for good! Click HERE to learn more about CleanCutting Sheets! Follow CleanCutting Sheets on social media!